After the Order issued by the Poor Laws Board in 1867 constituting the Metropolitan Asylums Board (MAB) to include the insane amongst its patients it built two asylums in London, one at Leavesden and the other at Caterham, each for 1,500 patients. They opened in 1870 and in the first few years admitted adults and children together. The MAB then decided to separate the children in order to give them training and to prevent them from copying the habits of many of the adults. It was thought that with proper training some of the children could be returned to the community thus saving the ratepayer money. From 1873-76, the children were accommodated in Hampstead and schoolmistresses appointed but the hospital could not be spared permanently for this purpose. The London Orphan Asylum in Lower Clapham was rented for 3 years and the children transferred there. A Medical Superintendent (MS) was appointed, Dr Fletcher Beach, who had been at Great Ormond Street Hospital for Children and the Bethlem Hospital. Miss Mary Jane Stephens was appointed as Schoolmistress. Whilst the school was being organised at Clapham a new site was secured for it at Darenth. The site, 250ft above the River Thames with views across the Darenth Valley consisted of 96 acres and was purchased for £8,300. The architect chosen to design and build the school was A C Harston. Apart from the schoolroom there were to be workshops, dining room, chapel, administration block and recreation hall. The accommodation was to be in 13 blocks. Five blocks three stories high, for healthy children. On ground floor level were the 3 blocks for helpless and paralysed, 1 for infants, 2 for epileptics and 2 infirmaries. In October 1876, the foundation stone was laid by Sir Edmund Hay Currie, Chairman of the Darenth Committee, Dr Brewer, Chairman of the Asylums Board and Mr Adams, Vice Chairman of the Asylums Board. They put a time capsule in a well in the foundation stone. The capsule contained coins minted in 1876, a copy of the Times Newspaper and other documents (copies of which are held in the Hospital Library and Dartford Reference Library). The location of the foundation stone was lost and the capsule was only found when the hospital was being demolished in 1995. By 1878, the Committee was anxious to move to Darenth as the site at Clapham was deteriorating rapidly, the laundry facilities were inadequate and the buildings were unsuitable for handicapped children. Dr Beach remarked later “To appreciate Darenth, one must have had a Clapham experience”. The Darenth Schools were opened for 580 children on 18th November 1878. The children were transferred from Clapham in covered wagons. The feeble and the helpless were wrapped in blankets and given hot water bottles. Dr Beach arrived with the first detachment and commented, “The ordinary discomforts of a removal of so large a family in its new home were cheerfully met by the staff”. But what of the children? The Grand opening took place on a bitterly cold December day. Dr Brewer, the Chairman of the Managers, said that, their purpose was to educate these children intellectually, physically, and as far as they could, economically. They hoped to make them useful to Society, and a credit to those who had undertaken the work. This was the first attempt by a statutory body to try to improve and develop the potential of subnormal children. In addition to schoolrooms, there were workshops for industrial training. So that there was no break in the training, and that these cases should not have to return to the general asylums when they reached the age of 16, an asylum for adults was erected on land adjacent to the Darenth School and was opened in 1880. I have the honour to submit the report of the Asylum for the year 1881, and regret that circumstances have occurred during the year that have prevented the Asylum being more fully developed. Last May, just as the new blocks were about to be opened, it was found necessary for the benefit of the Metropolis, that their hospitals cases of Smallpox should be relieved of cases becoming convalescent, so as to afford room for more acute cases, that could not be admitted for want of accommodation. So as Darenth was a healthy spot and there was room in the Asylum grounds, a hospital camp of tents was formed, and the new blocks, which were situated near the camp, were thus prevented from being opened for the recreation of imbeciles. The tent encampment was continued till autumn, when the weather proving too severe for out-door life, the camp was struck, and much to our regret, it was found necessary to remove the convalescent Smallpox patients into our new blocks, so further delaying the reception of imbeciles to them. The blocks, however, will, soon after the departure of the Smallpox cases, be thoroughly disinfected, so that they can be used without any danger to the people who will afterwards occupy them. Of course, we cut off all communication between the blocks containing imbeciles and the Smallpox blocks, and there was also a separate medical man to attend to the Smallpox cases. The cooking and washing for the imbeciles was done at the schools, and no person connected with the Smallpox Department used to visit the blocks containing the imbeciles, and most of the imbeciles and nurses were revaccinated. The number of patients in this Asylum on December 31st was 199 women, 24 men- total 223. 29 women were admitted during the year; 6 women and 1 man were discharged and 22 women died. Of the 6 discharged, 2 were not deemed suitable cases for this Asylum. Two boys and 2 girls have been discharged “recovered”, being a percentage of 3.4 on the admissions. They have all been sent home to their friends. One of those discharged “recovered” in 1880 has written me a letter, informing me of his condition. He says: – “Sir, I now take the liberty to write you these few lines, hoping this will find you in good health, as, I am very pleased to say, I am at present. Sir, I have not had any fits since, and I hope I shall not have any more. I have only been a soldier for one week, and the drilling seems to keep them off, and I feel no signs of them at present. The money is small, but I took it instead of being in the workhouse, and so I walked down here, and passed the doctor, and got sworn in. I have seven years to serve in this regiment, and five in the Army Reserve”. We still use the School Chapel, but although there are separate services for the two Asylums, and so more room is acquired, yet the inconvenience arising from wet weather is felt a great deal by some patients, and who are often for that reason compelled to remain away. The daily average cost per head for the maintenance and clothing of the patients in the adult Asylum, and of the children in the schools, has been at the rate of 10½d, and 10d for the half-years ended at lady-day and Michaelmas respectively. The amusements have been attended to as much as possible during the year, and in the summer the men played cricket, and the women were provided with a tent in the field and out-door amusements. Amusements for the children have been fully provided. Cricket, football, and bat and ball are the games chiefly patronised by the boys, and skipping and playing with the hoops by the girls. The recreation ground at the back of the School is a great boon, and is made use of when the daily and half day holidays occur, though advantage of the fine weather is often taken to send the children out into the woods, where they gather flowers and ferns, and in the autumn go on blackberrying excursions. Picture books, toys and games are always in use, and some swings, which have been put up in the wards, give much pleasure. Flowers and ferns grow in great quantities in the wards, and not only brighten them up, but are a source of interest to the patients. At Christmas they had a tree, with numerous useful presents on it for distribution amongst them. Dancing, however, they can seldom enjoy, although it is a pleasure that many of them would join in, as at present there is no recreation room for them, and their blocks are too crowded to clear a space big enough for them to dance in, without inconveniencing the other patients; also if they had a combined recreation and dining hall, their own blocks could become sweetened and purified during their absence at meal times; and although we are allowed the use of the hall over at the schools, yet during the winter weather there are many patients who cannot venture so far in the dark and wet evenings, and consequently suffer much disappointment. Special entertainments have been given during the winter months, as in the past years, and some of the more intelligent children are allowed to attend the nurses’ weekly dance, to which they look forward with great interest. At present, the men’s blocks are not opened, and we have only a small number of boys over from the schools, but they are employed as much as possible in the shoemakers’ and tailors’ shops. The female patients do needlework, and help keep their wards and dormitories tidy, and will help in the kitchen and laundry when they are again thrown open to the imbeciles. The chief changes amongst the staff have been male attendants, and I think this would less frequently occur if we could engage married men; but at present there is no accommodation for their wives to live on the asylum grounds or in the neighbourhood of the Asylum. Some Asylums have cottages specially built for that purpose, and it generally ensures a steady class of men. Visitors to the Schools have been less numerous than before, perhaps in consequence of the adjacent Smallpox camp; but some German professors, who came over to the International Medical Congress this year, paid us a visit, and in the autumn, Mrs Brown, the wife of a proprietor of an asylum for imbecile children in America, came to see our work, accompanied by some friends. The Inspectors of the Local Government Board and the commissioner in Lunacy have paid their usual visits. During the year the healthy blocks have been heated by steam coils, so arranged that one can be attended to without interfering with the action of the others, and the result has been perfectly successful The play-grounds have been gas-tarred, and the children can now get out to play much oftener than before. A night superintendent, whose duty it will be to see that the night nurses properly attend to their work, will soon be appointed, and the result will no doubt be increased efficiency on their part, which must be beneficial to the children. The occupied healthy block on the female side has been opened, and filled with little boys, and into the block vacated by them improved cases from the helpless wards have been drafted, so that every block in the Schools is occupied. The work of attending to the children, many of whom are in such delicate health, is now very heavy, and I hope that the time will not be far distant when the Committee will find themselves in a position to give me an assistant medical officer. The Dartford Chronicle for 12th November 1881 reported that ‘at the MAB’s Asylum at Darenth there was one of the largest bonfires in the district being fed with the articles lately used in the smallpox camps at that place’. Probably a celebration that they were at last able to move into their new blocks. The scheme was for the Schools to take children from 5-16 years of age and give them special education and manual training (children were not admitted from 1935-1959). Plans were to retain the improvable cases (certified imbeciles) in one part of the building. These cases were capable of being taught and able to work in industrial or manual occupations. The less helpable cases were in the remaining part. Unfortunately the beds at the MAB’s other asylums were filled rapidly and it was compelled to admit adult cases direct to Darenth. In order to deal with the situation, in 1888, ten single-storied pavilions were erected. The blocks were occupied by the ‘feeble-minded’. The patients mental capacity was far below the normal and their segregation was deemed necessary for their own interest. Results at the Darenth Schools were encouraging. All the children were unpromising on entry; few had any previous schooling. Within two years of opening only a small proportion of the 500 children were found totally uneducable. The majority had made some degree of progress, indeed some had attained a fair standard in elementary subjects and over 60 deaf and dumb children were taught sign language. 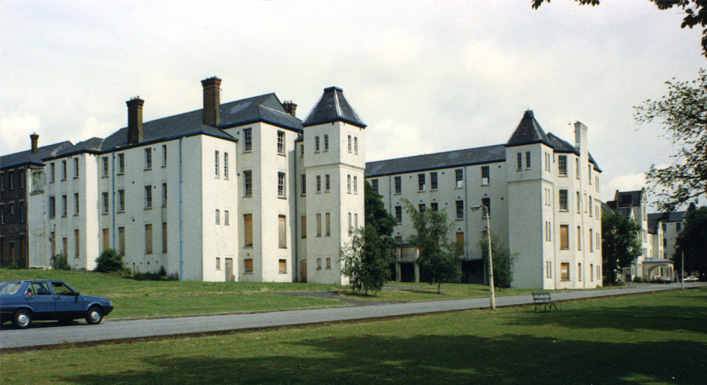 The colony at Darenth was of special interest owing to its education and training, it was the highest point in mental hospitals, and had many important visitors who came to see how well the colony was run and how well the imbeciles were learning and adapting to their new lives. The colony had its hours of work and of relaxation and its religious observances. They had dances, concerts, fetes, parties and a cinema. Fete days were held from 1882 until the closure of the hospital. They had a band with members from their own ranks and an organ built by the famous Retatus Harris. Also a Girl Guide Company (3rd Dartford Company) and a Boy Scout movement (Darenth Training Colony Troop of Boys). They were able to partake in competitions in sports and enjoy the use of a well-equipped gymnasium, and they received the ministrations from the creed to which they were attached.